Ever since the fall of fiat currency and the rise of credit and debit cards, countries around the world have been edging closer and closer to the cashless economy. However, as with any revolution, the transition period to this new paradigm of value transfer has proven to be more difficult than proponents expected. What happens when cash unexpectedly disappears? As a prime example, observe what happens when governments remove existing paper currencies from circulation. 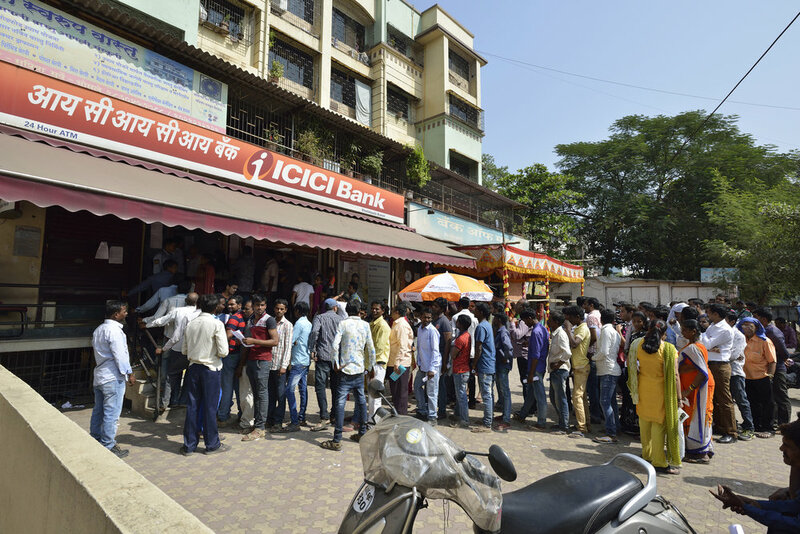 India's ban on 500- and 1,000-rupee notes has caused a scarcity of cash, causing interminable lines at ATMs. The economy is also suffering as the millions of vendors in India that previously relied solely on cash transactions experience a drastic reduction in sales. The transition in Venezuela went even worse when their president invalidated the 100-bolivar note, the most common bill in circulation, before replacement bills entered circulation. The loss of this note meant that citizens have been unable to pay for even the most basic necessities, causing subsequent riots and looting as people strive to secure their needs in the absence of cash. As these events prove, when one is unable to use cash for common transactions, one loses access to food, medication, and services essential to one's survival in society. A good way to prevent this is to follow Sweden's example, and slowly discourage cash payments over time via methods such as cash ATM closures and negative interest rates. One of the key methods by which cash transactions can be gently reduced is by adopting an alternative mobile payment system. This allows customers and vendors to interact without the need for a physical exchange of cash. This has another benefit of mitigating one's vulnerability to sudden changes in a country's currency model. Our mBeaconPay system, designed for accepting mobile payments at retail point-of-sale, is one way vendors in Scandinavia are making it easy for their customers to reduce their dependency on cash by making easy payments using only their smartphone. To find out more, contact us today for information on how we can help your business seamlessly adapt to the cashless economies of the future.